If sweet talk were cash dollars, the City of Santa Barbara’s budget woes would have quickly vaporized amid all the bi-partisan good will and high regard expressed at Tuesday’s swearing-in ceremony for Santa Barbara’s new mayor, Helene Schneider, and newly elected councilmembers Grant House, Bendy White, Frank Hotchkiss and Michael Self. Given that the election that put these five in their current positions was the most personal, acrimonious, and—with combined campaign contributions far exceeding the million-dollar mark—expensive ever, a conciliatory love fest was not a bad way for the new council to start. Incoming Councilmembers Frank Hotchkiss (left) and Bendy White. 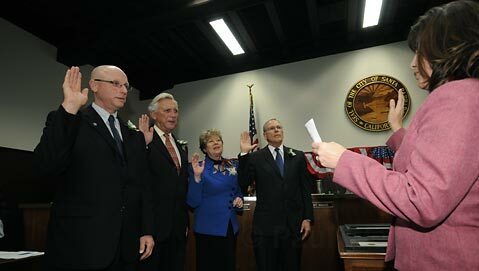 Stepping down to make way for the new elected officials were outgoing Mayor Marty Blum, who served two terms as mayor and two on the council, and councilmembers Roger Horton and Iya Falcone, who served two terms each, all precluded from running again by the city’s term limits restriction. 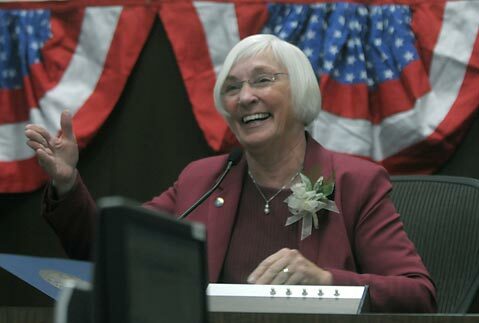 Falcone urged new councilmembers to be true to themselves, and, by way of farewell, said, “If you see me riding around on the back of a beautiful blue Harley, please wave and say hello.” She then quickly changed into a leather motorcycle vest bearing the insignia, “Brotherhood of Carpinteria” on the back. Roger Horton, now battling cancer, was praised for his passionate support of kids, trains, and historic preservation. Blum exhorted the new councilmembers to keep their minds open and their tongues civil. David Starkey, the city’s official poet laureate, warned in his poem, “Swearing In,” of the tough fiscal choices already made—libraries temporarily closed, for example—and the even tougher choices still looming: “This past Christmas, for days together books were locked from their readers. A man named ‘Freedom’ froze to death. Some mornings the air still smells of ash.” Combining blunt commentary with class clowning, homeless advocate and recent mayoral candidate Bob Hanson addressed the new council wearing a wig and a beard spray painted fluorescent green. He presented Schneider with a miniature shopping cart affixed to a tripod, and blasted the war on the poor which he charged City Hall has been waging. Dismissing the Ten Year Plan to end chronic homelessness, as well as the city’s 12 point plan to deal with homelessness—both championed by Schneider—as “bull,” Hanson complained that City Hall had locked up four public restrooms frequented by the homeless. Mayor Helene Schneider (right) and Councilmember Dale Francisco. 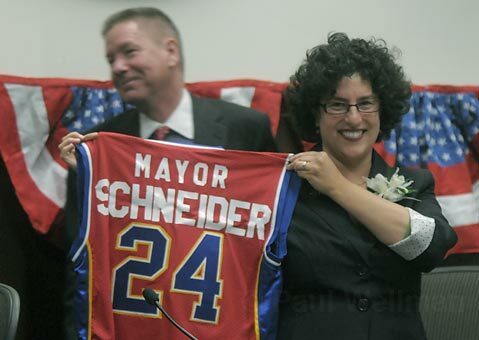 Shortly after winning election as mayor, Schneider started tackling some of the thornier problems on her plate. 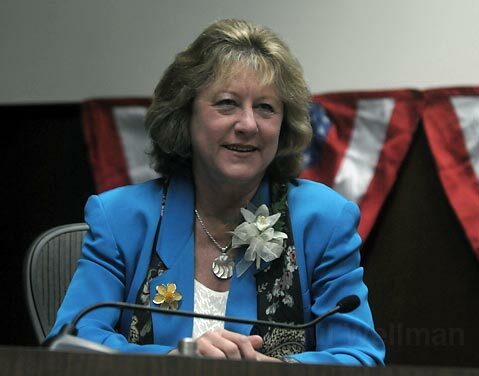 She contacted First District County Supervisor Salud Carbajal and Goleta City Councilmember Roger Aceves to find out the status of the South Coast Gang Task Force considering the imminent retirement from City Hall of acting gang czar Don Olson. County officials, confronting a $20 million budget deficit, are not eager to commit any funds to the effort. Negotiations with the city’s politically powerful Police Officers Association—which donated at least $65,000 to their slate of candidates this past November—are right around the corner; with an $8 to $9 million city budget shortfall looming on the horizon, Schneider is anxious to see what concessions the POA is willing to make. She’s also anxious to get started with a program allowing home owners to fund solar installations and other energy saving investments by “borrowing” against a voluntary increase in their property tax assessments. Down the road, of course, the council will again set to work on the long simmering update to Santa Barbara’s general plan, the city’s planning bible, to guide land use policy for the next 20 years. Intractable differences have separated traditional slow-growthers from so-called new urbanists, the latter more comfortable with higher densities and mass transit. City Council swearing in, January 12, 2010. Blum was quick to wave off discussion of her own mayoral legacy, stating, “There’s no solo act in government.” But more than any councilmembers can, the mayor personifies City Hall. As mayor, Blum proved exceptionally accessible, clocking 70-hour work weeks, answering every email, and attending every ribbon-cutting. People who mistook Blum for her school-marmish persona—she is a former elementary school teacher—did so at their own peril. Blum clashed famously with the police union, and still expresses regret at the size of the last contract City Hall approved with the POA, when the department was experiencing an exodus of trained officers leaving for other departments. While other politicos grumbled privately—and incessantly—about News-Press owner Wendy McCaw and her editorial page alter ego, Travis Armstrong, Blum declared open rhetorical warfare on the News-Press, proclaiming in a mass-mailed fund-raising missive that there was “a stench” emanating from De la Guerra Plaza where the newspaper offices are. 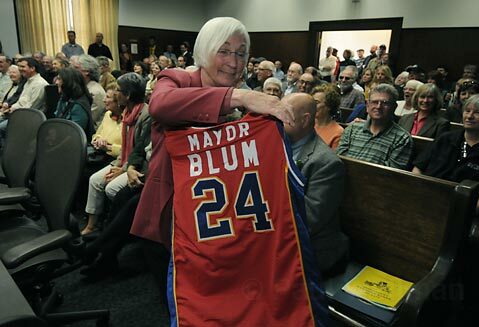 Blum loved being mayor with a formidable ferocity. While stricken with breast cancer early in her second term, she became convinced that Councilmember Falcone was planning a putsch. (Falcone denied this.) Only three days after having both breasts surgically removed, Blum was back at the job. She spoke publicly and openly about her ordeal, inspiring and comforting many in the community of cancer survivors and their families. Relations between Blum and Falcone, however, remained sour ever since. 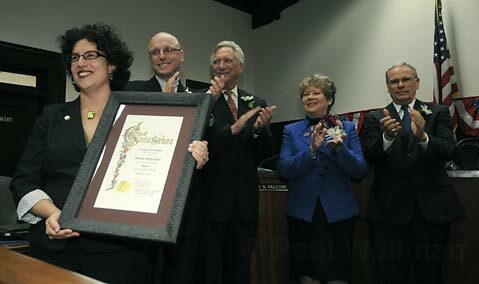 As mayor, Blum exerted a much lighter hand on the council than did her predecessor, Harriet Miller. 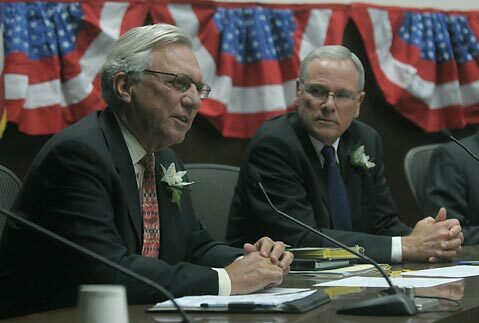 For good or for ill, the City Council was both more open and more unpredictable. Councilmembers feuded more publicly, but they were also more involved in policy-making. The outcome of key votes was far from pre-ordained, and Blum’s own final position often came as a surprise to her council colleagues.